We visited a very small shed in an unassuming cul-de-sac in Thatcham, Berkshire - the place where "Andy's Ukuleles" are based. These are not your 'regular' ukuleles, though. Andy makes two sizes, Piccolo and Nano. The Piccolo is just over sixteen and a half inches in length and the Nano eleven and a half. Andy jokes that the workshop is so small, with space for just one person to work, that there's no room to make a baritone. Standard woods are mahogany, these are all solid tonewoods, of course, but he has made them in other woods, a beautiful lacewood piccolo was almost finished when we were there. Other woods are by discussion and with an extra cost. One of the first that Andy made was a piccolo sized, Koa ukulele, but he's keeping that for himself. I put it to him that someone might offer him a lot of money for it, but he's insistent that he's keeping it! It has one of Krabbers' famous green fishing line A strings on it, too. 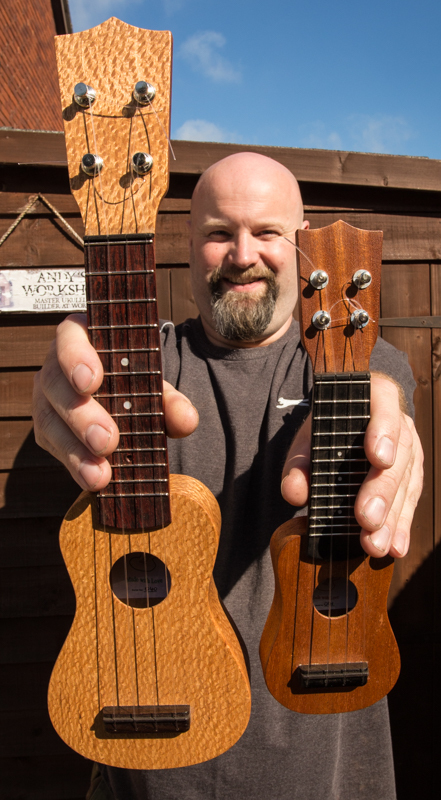 Andy was inspired to make his ukuleles when he first saw an iUke, which he thought was a little too flimsy and not of a brilliant build quality. Also, the strings he uses are of a slightly larger gauge making the A string a bit less prone to breakage like the iUke. 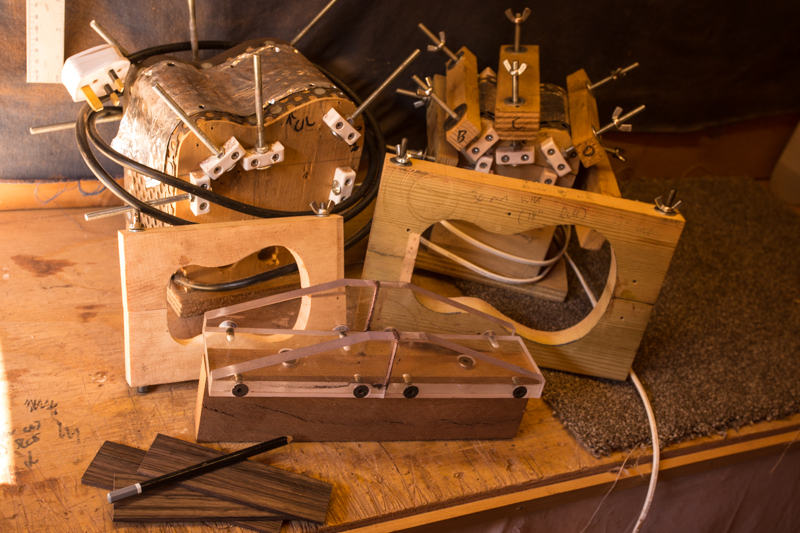 Instruments of torture, or ukulele building? Playability wise, we will do a review at some point, but the Piccolo size is perfectly playable, there are fret markers on the top and sides and the average ukulele player used to a soprano will be able to play it with just a little more concentration and practice. The Nano, however, takes a bit of work. For a strummer, it's a real challenge, getting the fingers in for chord shapes is tricky, but one technique is to use the fingernails. Finger pickers will find it more rewarding, for sure. The Nano isn't too loud, but admittedly it's on the novelty end of the ukulele spectrum, anyway. Friction tuners are used on all of Andy's ukuleles. He hates geared tuners! So far, Andy has made over thirty ukuleles, and has an order book (and waiting list) of at least another thirty! It's best to contact him if you need a timescale. He will ship to anywhere in the world, with quite a few going to the USA already, shipping there is a little over £20, so it's not prohibitive. If you want to try one, Andy does get around to a lot of the festivals, he will certainly be at GSUF in 2015. As for pricing, the mahogany nano uke is £125, the piccolo, £140. Enquire via his facebook page here. There's a full gallery of pictures from our visit here. We've ordered a Nano, we will review it when we get it, but it might be a while!